Why is all of this important? I believe if we eat meat, then the animals it comes from should have had a good life. Meat raised like this does cost more than pigs reared indoors in factory farms. But the difference in cost is directly attributable to the quality of life the animals lead. When it comes to meat, I don’t think that cheap should be the dominant selling point if we care at all about animal welfare and farmers being able to make a living on which they can survive. If you’re buying meat produced in this way, you can be sure you are supporting small scale, free-range farming, rather than factory farming. You’re giving money to a farmer rather than to a supermarket or middleman, who don’t always treat small farmers very well. 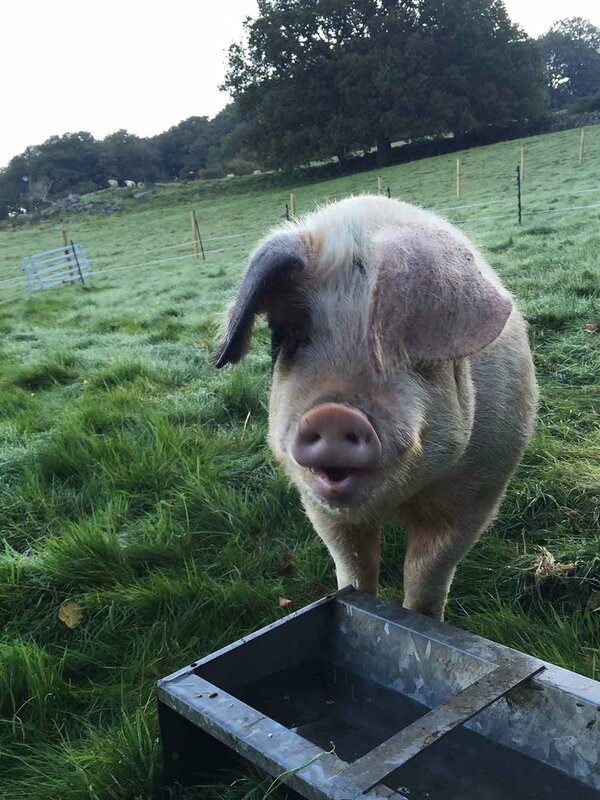 You’re also supporting the survival of native British breeds, like Gloucester Old Spots. But perhaps most importantly, the meat from these pigs tastes dramatically different to ‘normal’ supermarket pork. That’s representative of a life well-lived. Ever had issues with making crackling happen? You won’t with this meat because there is no added water and a decent layer of fat necessary to make naturally great crackling! A bit about looking after the environment…Pigs graze and dig, which means individual paddocks need a rest every now and then. But the pigs also fertilise naturally as they go, so they move out to another one and the grass and plants regrow before they move back in. I have a relatively small area of land, so I control the number of animals I have on it. I don’t use any other fertilisers or pesticides. This is the way I choose to produce decent meat.